After a brief hiatus, Around the Office is back and better than ever, and we are confident that you will enjoy reading about Rocco & Associates in this new blog format. Don’t forget to share with your friends, co-workers, neighbors, and family members! Our Round Table events return this summer, starting with American Funds on July 24 and another to follow in the fall. The topics are now expanded to include all areas that relate to building a comprehensive financial strategy. Stay tuned for detailed topic information and dates later this month. If you would like to know more about an upcoming event or register you and a friend, please contact us at 203.255.6022. On May 15th, we had our official open house and it was a great way to introduce our clients and friends to our new home at 1248 Post Road. Thank you to everyone who attended and for the positive feedback! Remember: If you weren’t able to attend, we are always happy to host clients and friends, whether it’s to say a quick hello or to review your accounts. In our continued efforts to engage and educate our clients, we have launched a new, streamlined website and expanded the digital platforms on which we communicate to include monthly blogs, video newsletter, and daily content updates on our website. As such, Around the Office will no longer be a part of the monthly newsletter, but its own monthly blog. 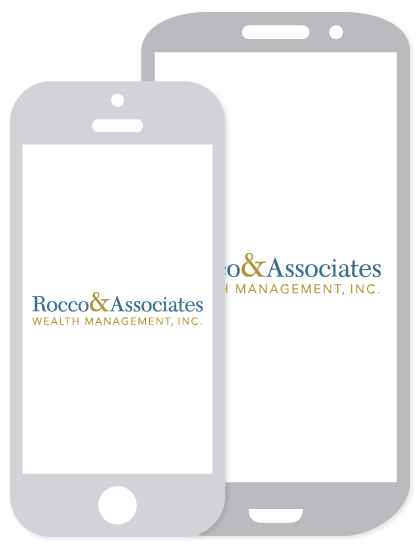 Also, be on the lookout for updates on the new Rocco & Associates mobile app and re-designed social media platforms. Don’t forget to like us on Facebook, follow us on Twitter, and connect with us on LinkedIn to receive updates! Let us know if you have any questions about are new offerings, or want to see more of a particular kind of content. We encourage all of our clients to come in for an insurance review. Taking steps to reduce liability and protect your loved ones’ financial future is an important piece of your ongoing financial strategy. While we regularly review our clients existing wealth holdings, often times we are unaware of any insurance policies that you may hold outside of our business together. Bringing these to light can help us keep track of your full financial profile and assist us in crafting accurate financial strategies. We are experienced in making your entire financial profile work for you.